There are many definitions of innovation and the one I like the most is ‘innovation means cutting out the unnecessary‘. The ‘invention’ of single serve coffee is then the antithesis to the definition of innovation. Smart Planet covered the increasing mountain of used ‘pods’ with 13% of offices and over 10% of households in the US now jumping on the pod wagon “hundreds of millions of pounds of “pod” trash is entering landfills every year.” That’s 15 million coffee pod machines in the US alone – the equivalent of two coffee pod machines per household in Australia. Imagine if the history books had been the other way round. Now that would be heralded as innovation – removing the unnecessary waste of pod coffee. What other innovations have added the unnecessary rather than cutting it out? Help me get a top 10 list together – can be anonymous or credited, just let me know which you prefer. ← Technology is revolutionising participatory planning – what will you do? Interesting point, although having worked for Nestlé for many years and currently working for Amcor (who supply the packaging material to Nestlé for Nespresso) I do have a different perspective. If you take it from a total lifecycle point of view, the most inefficient way to make your coffee is the American drip-filter style. They start by boiling water that drip through the coffee grounds onto a warmer until eventually somebody takes a cup (or not). This is extremely wasteful use of electricity. Perhaps the next worse option is instant coffee – which takes considerable energy to extract the liqour for spray drying/freeze drying to remove the water. 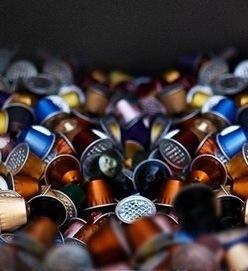 Nespresso encourages the capsules to be recycled (even in Australia). If the amount of energy required to produce the coffee is less, and the packaging can be almost fully recovered, I’d suggest that coffee pods are probably your greenest option for in-home and in-office consumption. Thanks for the comment, do you know if there has been a study done of the total ecological footprint lifecycle of making coffee from bean to grave? It would be interesting to know where the biggest impact is – it maybe that the impact of the beans is so huge that whether it’s pod or drip doesn’t really make any difference. And you are right the Nestle ability to recycle the pods makes Nespresso a much better option than the plastic alternatives. I remember seeing a study that considered the total electricity usage from bean to cup, but I can’t seem to find it on a quick search that I did now. If I can’t find it, I’ll email Claus Conzelmann the head of sustainability at Nestlé and ask him if he can share it with me. If I remember correctly, the reason for the study was that Nestlé does not have large soluble business in the United States. I believe they were trying to make the case that if the US moved away from their roast and ground coffee onto soluble coffee, there would be (not insignificant) impact on national electrictiy consumption and therefore carbon emissions. could we just chew the coffee bean?